Hello and welcome to Part 3 of the Wade's Blanket CAL, hosted by Zooty Owl and Kokopelli Design. It is not too late to join this Crochet-A-Long! 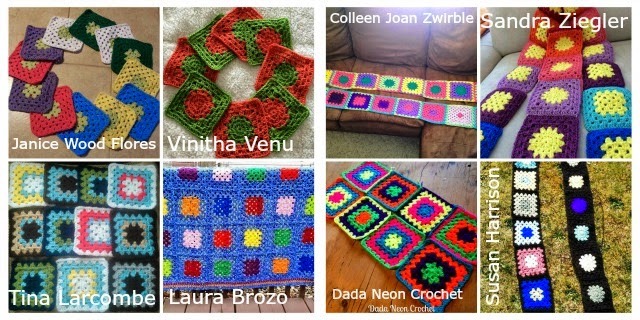 The patterns will remain on our Blogs - so you can crochet along at your own pace. Please feel free to share your progress photos with Andrea and/or me on Facebook so that we can include your photos in our Gallery!! The amount of yarn required depends on the size of the blanket you would like to make. The one pictured in the photo is 110cm x 110cm - I used just over 600g (1800m) of yarn. A 150cm x 150cm would probably take 800g - 900g. Gauge is not too important with this blanket. Yarn thicknesses vary somewhat from brand to brand as do the tensions of individual crocheters. The most important thing is that your tension remains even throughout the blanket - this will ensure that your squares will always be the correct size, for example if this square measures 14cm x 14cm then the next two patterns will also measure 14cm x 14cm (instead of my 12cm x 12cm) and the fourth one 7cm x 7cm (instead of my 6cm x 6cm). Zooty Owl's Colourway: Denim Blue, Blue, Turquoise, Lime, Bright Green, Lemon and White. There you have it - The Tall Stitch Daisy Square!! Make as the same number of these as you made for Parts 1 and 2. Have fun making your squares and see you again in two weeks with Part 4 of Wade's Blanket. Muchas gracias por todo lo que aprendemos.